Seeing all the reds on the runway of A/W 2010 New York Fashion Week has got me itching to wear the color. Hope you ladies like it! 1. Even out the skin with Chanel foundation. 2. Using MAC 266 Small Angle Brush, fill in eyebrows with Stila Espresso. 3. 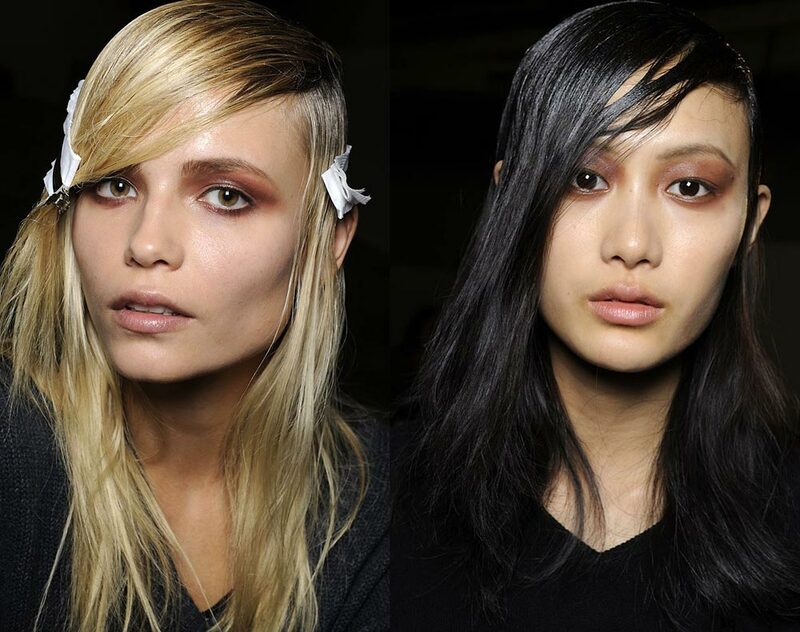 Apply the coppery red color (top left) from Sleek Palette on the eyelid. 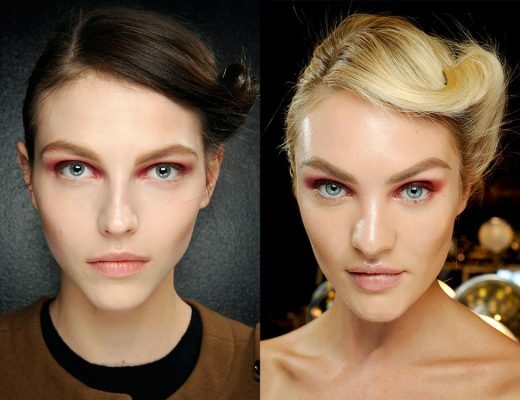 Blend the burgundy red color (second from the left on top row) onto the crease and lower eye. 4. Highlight the inner corners with MAC Perverted Pearl. 5. Rim the eyes with MAC Blacktrack. 6. Apply fake lashes on top and Rimmel mascara on bottom lashes. 7. Apply MAC Shape and Sculpt Powder along the bridge of nose. 8. Apply MAC Myth on the lips. Like the look but too scared to wear red around the eyes? Stay tuned for a tutorial on how to rock the color! Images: Imaxtree and Greg Kessler / FirstView.com. WOW phyllis! i’m just blown away!! you look absolutely amazing! Absolutely gorgeous! Its such a pretty look. Oh my goodness, girl! You’re looking fabulous — and I just love those lashes! 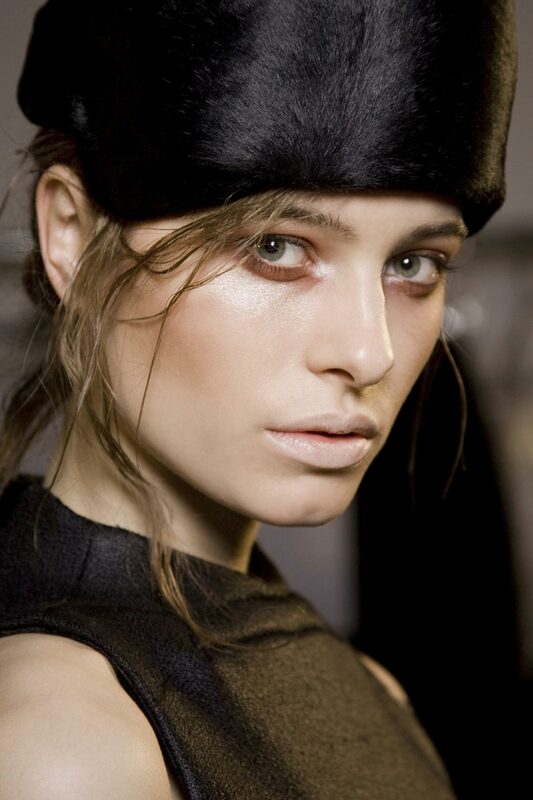 when I first saw the pictures you posted of the fashion show w/this makeup, I thought it looked strange and unappealing. however, it looks AMAZING the way that you did it. i don’t have your coloring so i doubt i’d reach for anything red near my eyes, but it looks so good on you! by the way, i’m dying to buy your lashes.. are you still selling them? I have to agree with the previous comment. The runway models looked pretty strange, but you really make the makeup look wearable! I really like this look! Do you have recommendations for eyeshadow colors similar to the ones you used? I still have some lashes available. I’ve been busy so I haven’t gotten around it but if you are still interested, just shoot me an e-mail! I’m pretty sure you can find similar colors at MAC or even the drugstore. I’ll post some alternatives later this week. First time visitor here. =) Red is one of those colors I’ve never considered for eye makeup and am now tempted to get some. It looks great on you! wow. i love this so much! beautiful. i want to go out and try reddish brown shadows now, they seemed impossible to pull off before i saw this post. you did a good job! thanks for the inspiration. hey! what blush are you using here? I’m not wearing blush here. It’s just my natural flush. I love the colors in this Sleek I-Divine Palette in Jewels, especially the 2 you used. Please tell me where I can buy it in the US as it seems to be only distributed in UK (from what I understand from browsing the net). It is always hard to find the right colors…I use to have a palette of eye shadow in those burgundy tones my mum gave me for a birthday when I was a teen. It was from Yves Saint Laurent, and a real treat at the time. Little did I know that it was also a limited edition and I was never able to find the right colors ever since (that was some 15 years ago!). So I would really like to put my hands on one of those if only I would know where to buy it. Thank you for bringing it to light! I got my Sleek palettes when I was in London. You can probably find them on Ebay.